Despite being born in Australia, my Sri Lankan heritage dictates that every few months, I will crave a disproportionately large serving of hoppers. They are one of the greatest food exports from the resplendent isle. Hoppers are hemispherical rice flour and coconut milk pancakes, crispy along the sides while soft and fluffy in the middle. 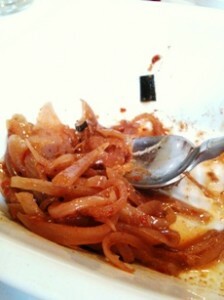 The base mixture is usually fermented overnight to impart a richer flavour. Eaten with both savoury and sweet accompaniments, they are what food dreams are made of. 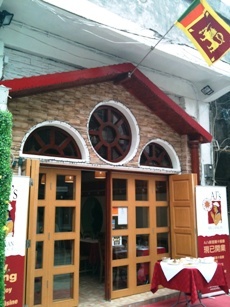 Anyhow, six years in Shanghai meant six years without a Sri Lankan restaurant (that we were able to find, anyway). The only friends who knew how to make hoppers left Shanghai before we could share the joy, so hoppers became a twice or thrice-a-year event on trips back to Melbourne. A travesty. We could have sourced the correct hopper pans and made them ourselves, I guess, but that would have required effort. Having recently moved permanently to Hong Kong, my wife and I were elated to learn of a newly-opened Sri Lankan restaurant in the city. Well, not quite the city, more like 50 minutes from Central on public transport, but a 50 minutes happily travelled for hoppers. 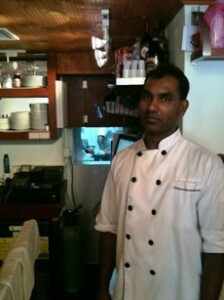 The restaurant, AJ’s Sri Lankan Cuisine, is located close to the pier in Sai Kung. There are several ways to get there, and these are explained well on Sai Kung’s wikipedia page. We took the MTR from Central to Choi Hung via Yau Ma Tei. From Choi Hung MTR station exit C2, there were normal buses 92 and 96R, and a constant stream of the crazy-but-efficient minibuses (route 1A), to Sai Kung pier. The scenic bus ride was about twenty minutes in duration. Arriving at Sai Kung peer, getting to AJ’s was a cruisey five-minute walk south along the waterfront. 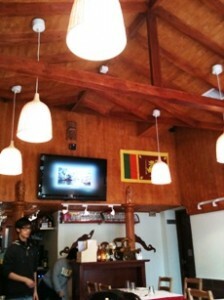 If confused, look out for the Sri Lankan flag flying from the roof of the restaurant. The friendly proprietor and chef, “RJ” Muthu Mudalige, wasn’t sure whether I contained traces of Sri Lankan nuttiness or not, but suspected something was up when I engaged him in a discussion about hoppers, among other things. His restaurant has been open since late 2009. While manning the kitchen of local tourist-friendly restaurant Anthony’s Ranch, RJ decided to set up his own operation, and AJ’s was born. A pleasantly small and unpretentious space, AJ’s seats around 30 people at full capacity. If the various ornaments and wood-lined interior weren’t invoking a bit of Sri Lankan nostalgia, the wall flag and LCD-screen slideshow of beautiful photos certainly were. The attractively-priced 68 RMB brunch menu is a recent innovation at AJ’s, offering a choice of main course, starters consisting of RJ’s special spicy carrot muffin and fruit salad, and a choice of drink including good quality Ceylon tea. We chose the hoppers for the main course, of course, and with our eyes typically bigger than our stomachs, decided to order a cashew nut curry (unique to Sri Lankan cuisine as far as I know, and a must-have for my wife and probably yours, too), a seeni sambol (a caramelised, spicy onion dish), and fish cutlets. The hoppers came with a small serving of katta sambol (basically, a spicy dip), but I highly recommend ordering at least one curry to get the full Sri Lankan experience. As mentioned above, plain hoppers can be eaten with both savoury (curries, sambols) or sweet (jams, condensed milk, coconut concotions, palm sugar, etc, etc, etc… oh man) accompaniments. My favourite, though, is the egg hopper, which is simply an egg cracked into the middle of a cooking hopper. The eggs are usually done ‘over-easy’ so that you can dip the crispy sides of the hopper into the egg, if that’s your thing, as it is mine. I can usually eat four of these without blinking an eye or taking a breath. I have had no food coma that matches the severity of a hopper coma, but it is always worth it. With some restraint – some would call it poor form – I only had two egg hoppers at AJ’s. They were great: not too rich and not too light. 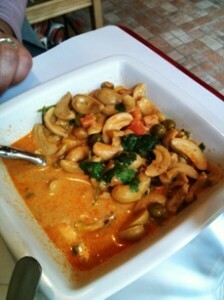 The coconut milk and salt in the mixture were well apportioned, and the yeastiness was at a comfortable level. The egg yolk wasn’t runny, which was the only slight disappointment, though in fairness to the restaurant, we did not specifically request it. I forgot to ask RJ about the hard yolks, though I presume this is to make the egg hoppers more acceptable to a wide base of (typically runny-yolk averse?) patrons. Boohoo to that! Next time, we will make a request-for-runny in advance. Again, the egg hoppers were still great to eat, with the right amount of salt and good texture. RJ mentioned that the hoppers are usually available for brunch only, so if you intend to head out to Sai Kung for dinner, it would be wise to call a day ahead and talk to RJ about your hopper requirements to avoid disappointment. The cashew curry was excellent, if not a bit too well-endowned with cashew nuts and peas (which could well be your thing, and who would I be to judge?). Neither too oily nor too spicy, it was a great dipping choice for the plain hoppers. The seeni sambol, though, was too raw and mild for our liking. Usually, seeni sambol contains a generous portion of onions very well fried together with maldive fish to create a sharp and spicy side dish that has the eater craving for plenty more (despite the potentially unpleasant side-effects a few hours later), but this version was just too much like regulation stir-fried onions. We quizzed RJ about this, who understood our consternation, and explained that the recipe was to appeal to a broader (presumably Chinese and European) palate, and was important to ensure his customers weren’t making like afterburners the following morning (my words, not his!). He mentioned again that next time we visit, we could place an advance order for the spicier, more ‘authentic’ version of seeni sambol. We’re already looking forward to that! 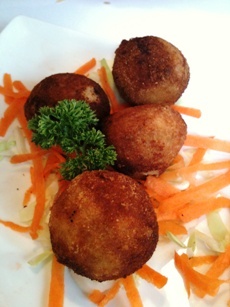 Fish cutlets are another personal favourite. They are small golf-ball sized portions of joy, rolled, lightly breaded and deep fried. Absolutely no one can beat my mother’s version, but RJ’s were well executed using mackerel and an even mix of pepper, spices, and finely sliced vegetables. We’d certainly order them again next time. As my wife and I are vegequarians/pescatarians/vegetarian wannabes, we couldn’t try the lampreis, another Sri Lankan must-have. Lampreis is a selection of condiments and meats (seafood and vegetarian options can sometimes be found, but not yet at AJ’s) served on a bed of either plain or flavoured short grain or basmati rice, then wrapped in banana leaf and steamed. This process infuses the contents with the aroma of banana leaf, and the outcome tends to be absolutely unforgettable. 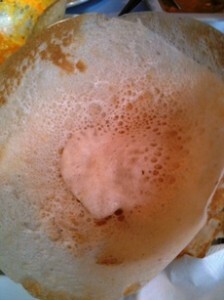 Many food dreams are made of this, too, and lampreis usually vies with hoppers for a Sri Lankan’s meal of choice. The table in front of us tried the chicken lampreis and were full of praise. For Sri Lankans reading this, Elephant House drinks are available at AJ’s! For everyone else, I recommend trying either the Ginger Beer or Creaming Soda. Whenever I visit Sri Lanka, I go through at least one Elephant House-branded drink a day, which is both necessary and good for the soul. There were plenty of other food favourites that we weren’t able to try, including the fish curry, eggplant moju, lentils, kotthu roti and string hoppers. We’ll be saving those for future trips back to AJ’s. I love a restaurant with an approachable and humble, yet on-task owner, and RJ certainly fits that bill. His passion is understated due to his mild character, but it is well evident in the quality of his food. Check out AJ’s website and full menu. For those with excitable and adventurous taste-buds, a lust for spice, or an intrigue for the hopper phenomenon, I recommend this restaurant highly. Great review mate, from one Sri Lankan Australian to another. Went to AJ’s today after a long day… glad I had read this great review first for recommendations. 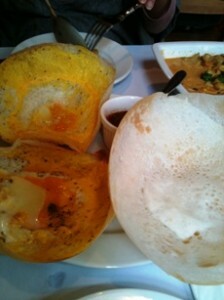 Also helped me explain some these dishes better to my friends who had never experienced Sri Lankan cuisine before.